My SE2 has been on a little journey over the past 5 1/2 Years. I sold my old one (L368 ETG) with deep regret. So with that always annoying me, it was only a matter of time. After a looking at a few and discussing my plans of what I wanted to do. I chose the SE2. Nice redtop lump in which was the only good bit about the car. I removed the awful chrome trim on the journey home. When I got it home the first thing to get rid of was the black bonnet 4 hours of polishing and remove the filler from the roof rails. It was still wet somehow. Brakes were fitted wrong way round as they were drilled and grooved and the stereo was a maze of wires covered in tape. Yup. What a bargain(shed) I got for 200 quid. Few months of driving and sorting all the issue out, I got bored. On went a full body kit and a 3 month trip to the body shop. Results here. I drove around for a while but still wasn't right. I bought a boot install from a lad in Torquay and it lowered the rear end for me. So much so the rear bumper was ripped of on a speed bump. It was too big anyway!!! Back to the body shop it went. With me now happy with how it looked for a bit. The c20xe got a bit boring. Out it went. 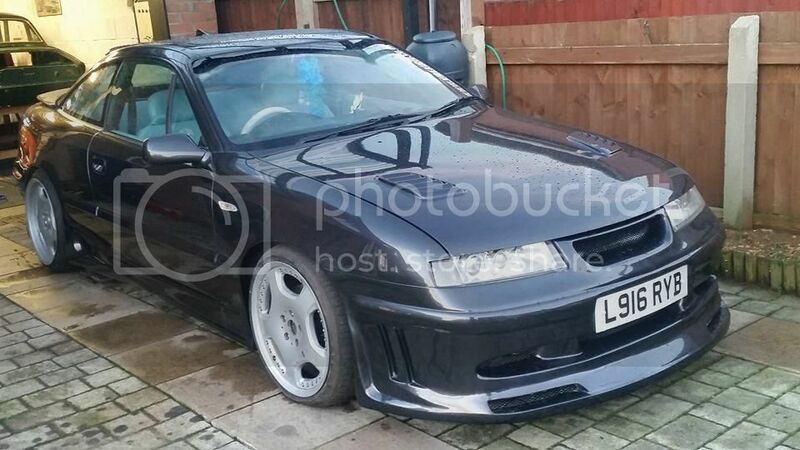 Bought a 2.5l Calibra (M606LAB) as a donor car. This change was emotional. I changed everything. 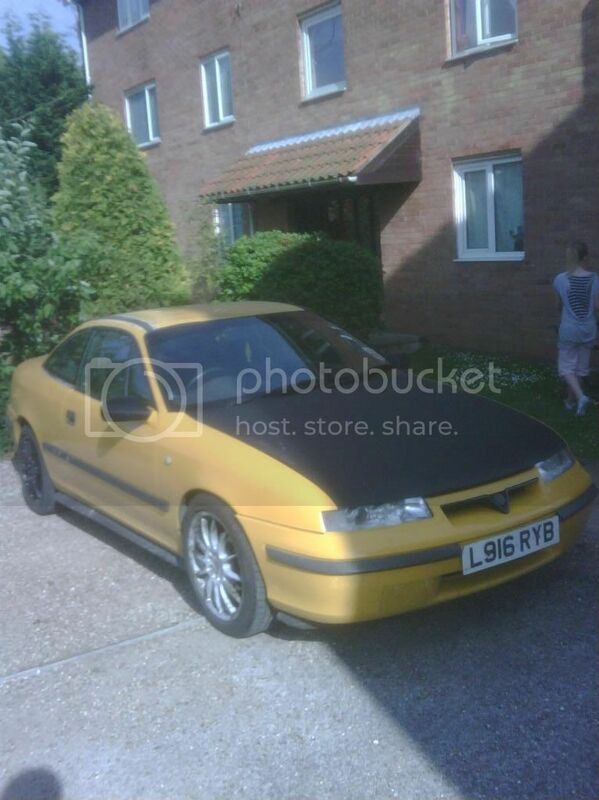 Dash board, interior, engine, brakes, exhaust, suspension, carpets. Now this made me smile. 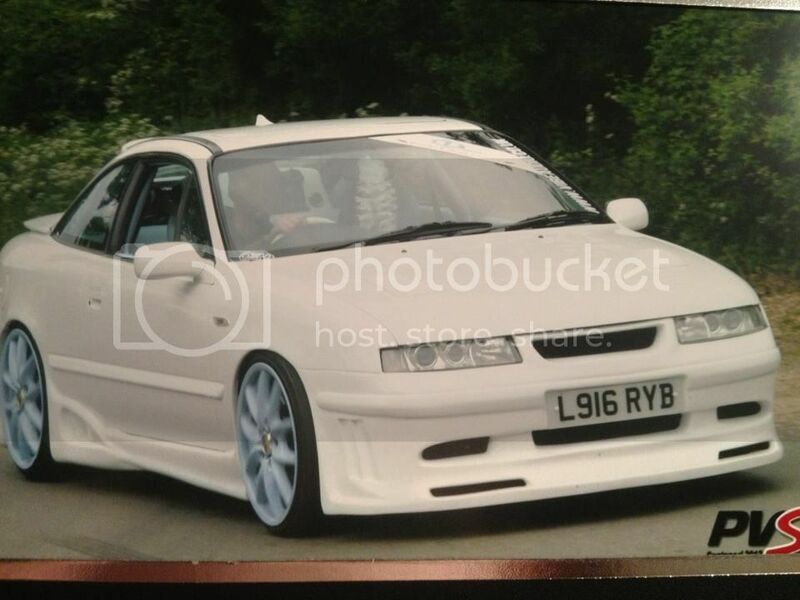 V6 rumble with a car that looked alright. Happy days. This lasted a year. I got bored again. I was showing the car at every car show there was. I fancied a change. So this was the time to fit Porsche Cayenne wheels. 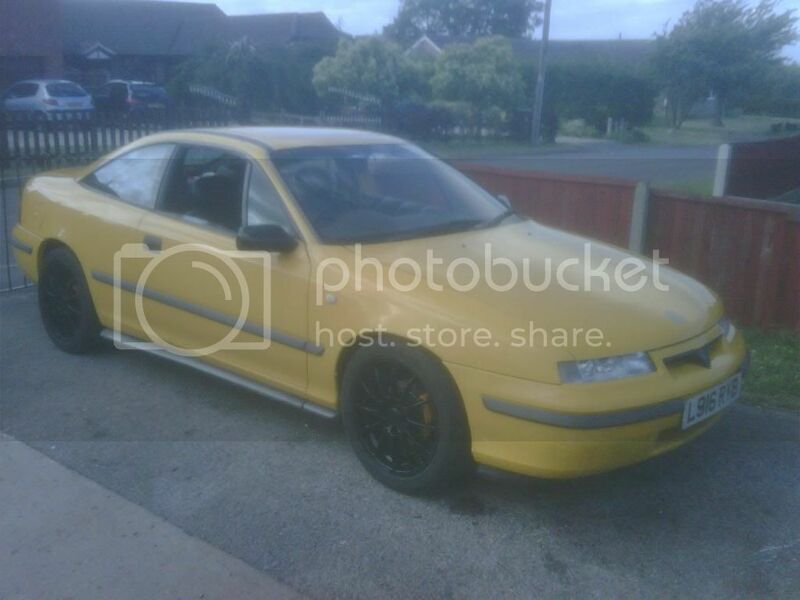 19s x 9" all the way round with stretched 215/35/19 tyres on. 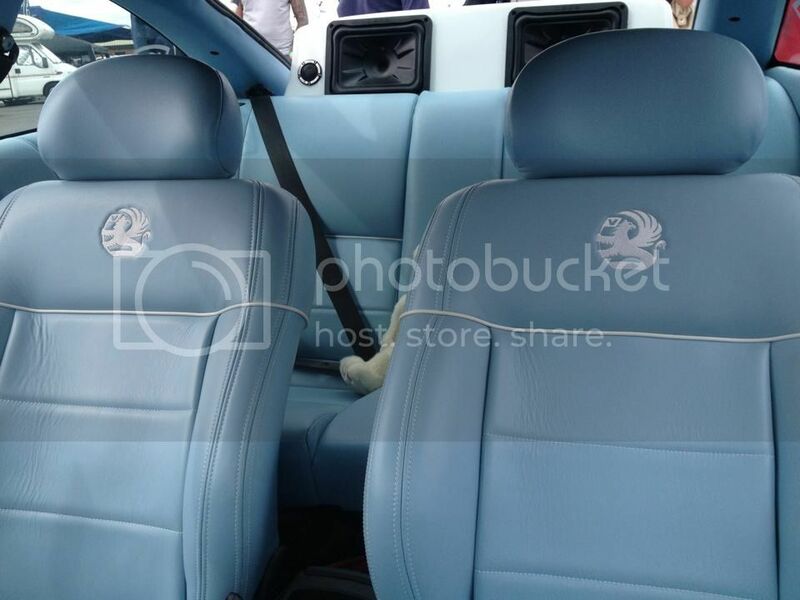 The at the same time came the baby blue custom leather interior. It stunk. The front bumper annoyed me a little bit now. So with a few stone chips it went into the bodyshop again. To fit the bumper. But because every panel is smoothed together. It received a full re-spray (AGAIN). No point doing something which will look awful. By this stage I was sponsored by VIBE Audio. The install changed and it was a lot louder. ( The neighbours wernt fans). 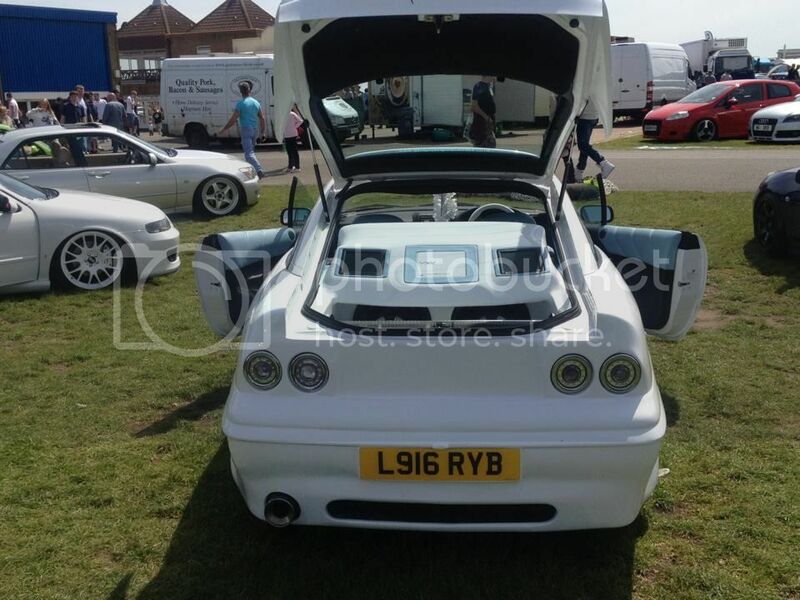 With them paying for shows and putting my car on their stand, the car had to be at its best. Early 2014 I got sent away with work. The car sat in the garage. Whilst I was away idea's came into my head. In plonked a 3.0l when I got back, The Porsche wheels were sold and on went a set of 3 piece split wheels, Mercedes wheels (5x112 stud pattern) Using wobble bolts its a direct fitment.... HAHA. 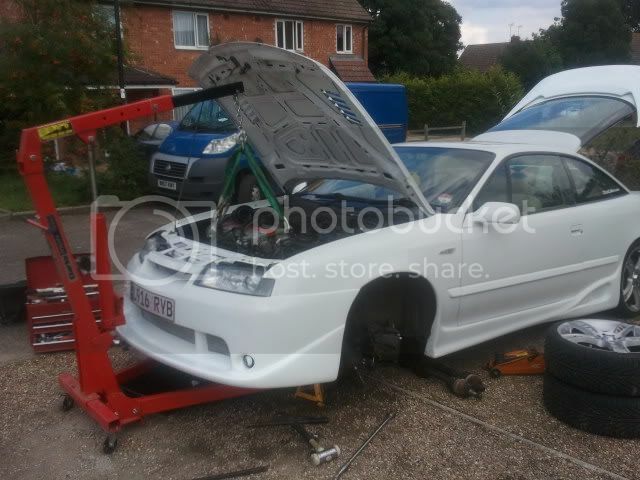 like you can say fitting 10.5" wide rear wheels on a calibra direct replacement. Well we got there. Well here we are today. It is probably now in the best condition its been in. I have spent weeks putting all the wiring loom and plastic trims where they should be. And finished everything of so it all now works. The boot install has gone but a new one is currently being built alongside Vibe. Once the car is MOT'd. The wheels are coming off to go for a refurb. Powder coated faces with polished lips. Jobs lined up are mainly underneath. I want it all protecting underneath and all the components removing and powdercoating. I also have a set of 4 pot brembo's which I am trying to set up a 355mm Disc and brake setup. HOPE YOU LIKE. thoughts positive or negative are welcomed. If your a purist, its probably not your cup of tea. I'm unsure on them myself. Part of me wants the Porsche wheels back on. If I don't change my opinion on them I will sell them. There uber rare so worth quite a fair bit The last set sold for £2500. Cost was 500, Re furb is only £350 so worth doing. I'm tempted to try same colour as the car. Kevcalibra wrote: I'm tempted to try same colour as the car. 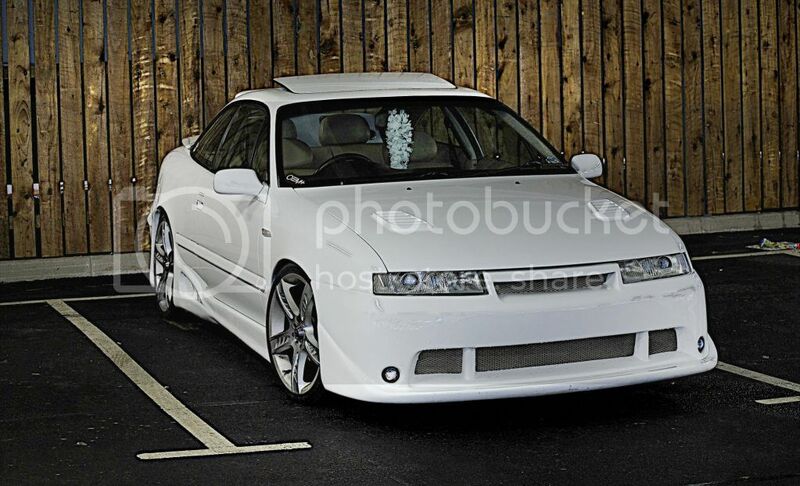 It will be at shows this year mate. Its been parked up too long. I've still not washed or polished it yet from the body shop. I think dark grey wheels will look fine on a dark grey car. They won't show the brake dust like silver either. They just lose their shine a little until the next wash.